Yeah, I know. Back to back Cookie Butter posts. Whatya want me to say? That I tried to make a different, completely in no way related to Cookie Butter recipe last week, and that it didn’t turn out. So, naturally, I turned towards another Cookie Butter recipe because I know for a fact that it wouldn’t let me down. Or, maybe, I could say that I’m just really into this whole Cookie Butter thing at the moment. Both of those statements, by the way, are true. But, don’t worry. This isn’t going to be a repeat of the pumpkin madness I put you through last fall. I may love me some Cookie Butter, but I also know that I can’t put it into everything. I just can’t. Trust me. I’ve been trying. It’s kind of becoming a problem. Each time I stick my spoon into the jar for a single—come on, call me out on that lie—bite, another idea pops into my head. Cookie Butter Sticky Buns? Cookie Butter Donuts? Deep Fried Cookie Butter? Yeah, I’m pretty sure I’ve covered it all. And, another thing, no one will take the jar out of my hand or help me eat it. I’m single-handedly devouring the jar of Cookie Butter by myself. And that, my lovely friends, is most definitely not okay. I mean, it is. But, it’s not. 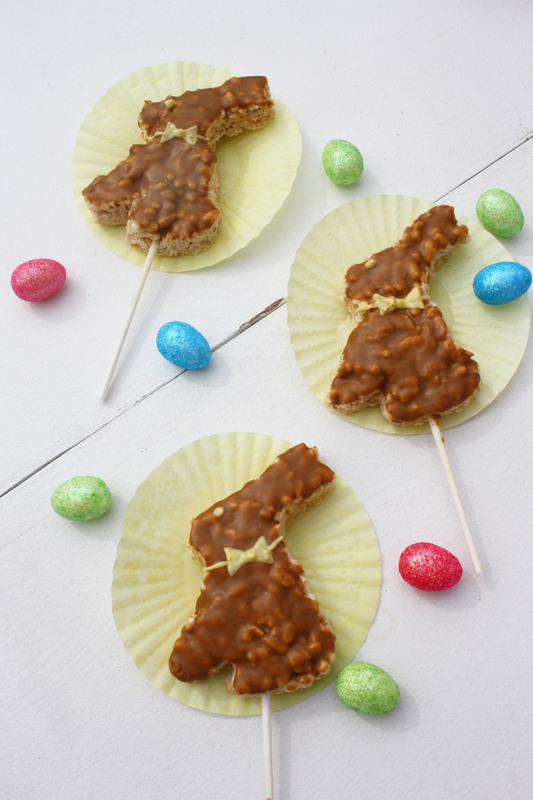 My solution: putting it in recipes, like these adorable Bunny Rice Krispie Pops, so then I can give them away to people, which means less Cookie Butter in the jar for me to eat. Winning, right? Enough about Cookie Butter. 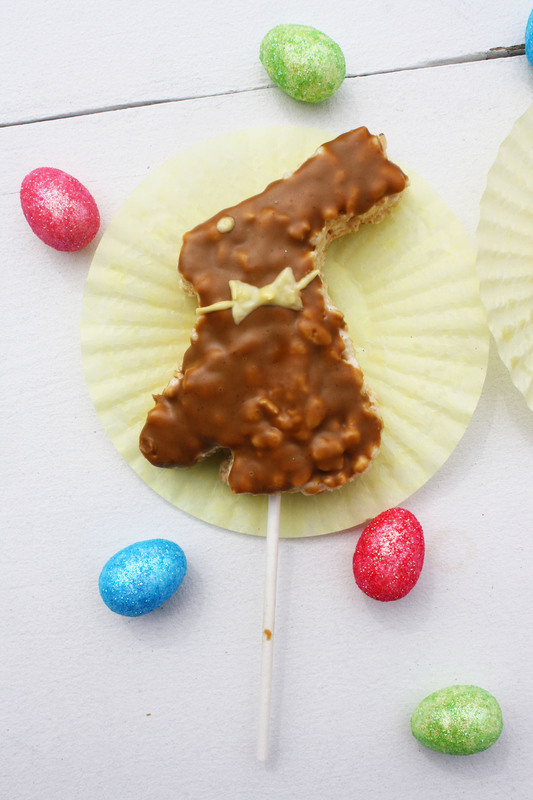 Let’s chat about these Bunny Rice Krispie Pops. Super cute, huh? I was originally planning on making something completely different for Easter, but somehow the day managed to creep up on me. It feels like yesterday was the first of April, and now, here we are, two days away from Easter and 18 days into the month. Where has the time gone? I don’t even know. With the holiday right around the corner, I wanted to make something that was easy, fun, and super adorable. 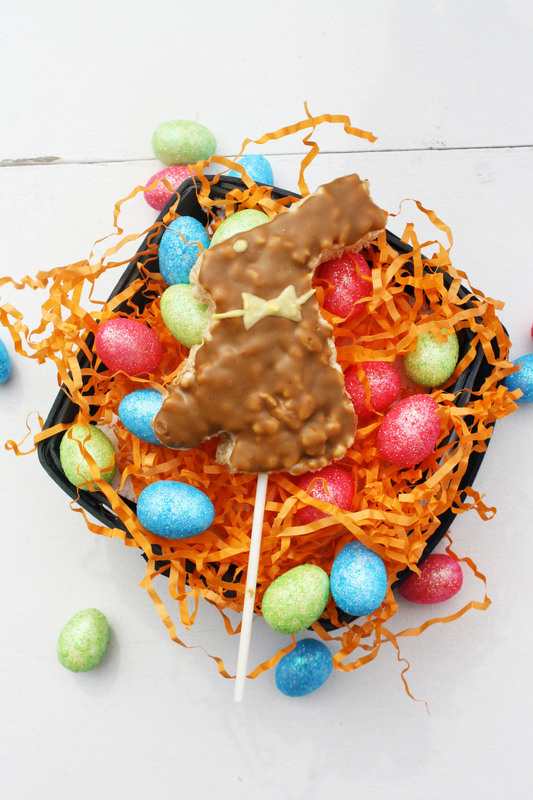 In hops these Bunny Rice Krispie Pops dipped in Cookie Butter. Rice Krispies are, to me, a classic delicious treat. All that crunchy, sticky, marshmallow goodness…who wouldn’t love that? Homemade Rice Krispies, in my opinion, are even better. Sure, they’re not as sweet, but the coating of Cookie Butter in these treats, definitely amps up the flavor. In a good way. A reallyy good way. Prepare a 13x9x2-inch pan by spraying it with non-stick spray. Set aside. In a medium-sized saucepan melt butter over low heat. Once the butter has melted, add marshmallows, stirring constantly until completely melted. Remove from heat. Stir in Rice Krispies until well coated. Using your hands—run them under cold water first—press the Rice Krispies into the prepared pan. Allow Rice Krispies to cool. 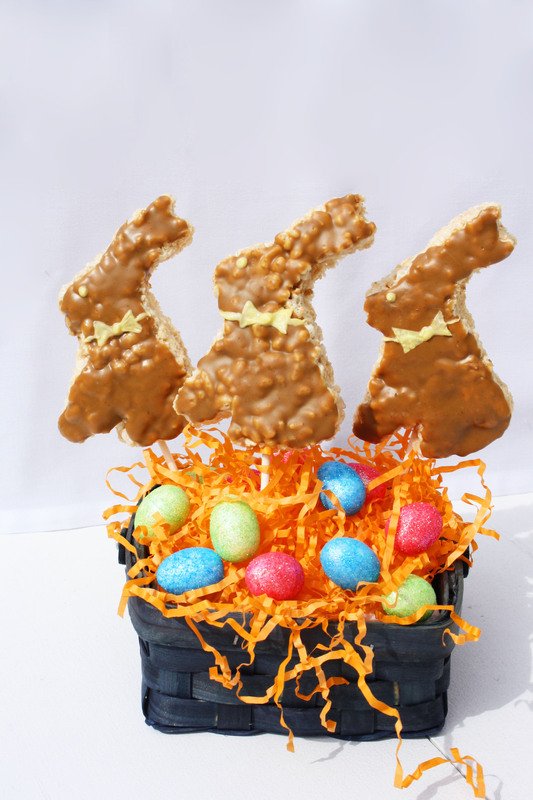 Using the cookie cutter cut out bunny shapes from the cooled Rice Krispies. Stick a lollipop stick in the bottom of each bunny. In a microwave safe bowl, melt Cookie Butter, in 15 second intervals, until of drizzling consistency. 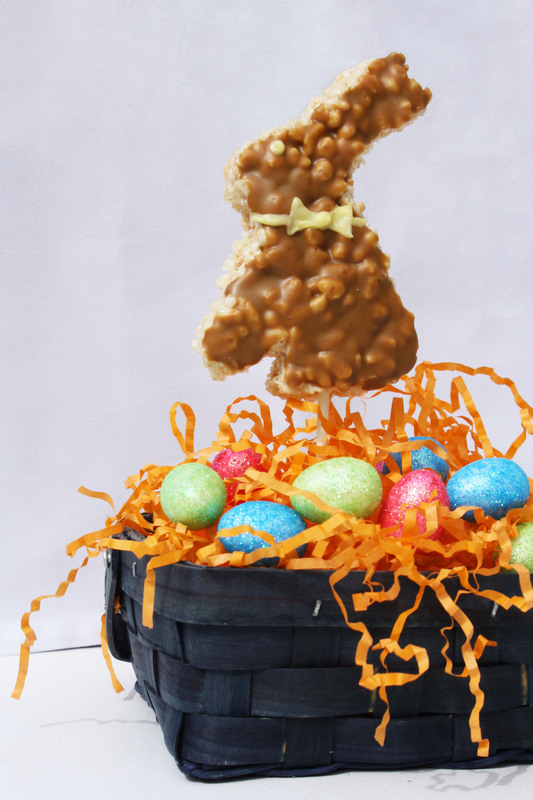 Dip the front of each bunny into the cookie butter or use a spatula to spoon melted Cookie Butter onto each bunny and spread it around. Allow time for the Cookie Butter to harden onto the bunnies. In a microwave safe bowl, melt chocolate chips, in 10 second intervals, until of drizzling consistency. Stir in yellow food coloring. Use a toothpick to give the bunnies eyes. Transfer the remaining white chocolate into a piping bag with a very small tip or a Ziploc bag with the corner snipped off, and draw on the bow tie. No! You’re special Meggan, so so creative and adorable!! !